What is visiting Venezia without an authentic ride on a gondola? Indeed, we went for the gondola which you can literally find anywhere around in Venezia. The gondola ride was a very comfy one and of course, very beautifully decorated. In the gondola, you just have to sit back and relax while enjoying the view around the waters. The kind gondolier will tell you all about the different parts and places of the architectures that have great history behind them. Once the gondola left the port for our short tour, I saw really nice view of more gondolas ahead of us with the sun almost shining right at us. I grabbed a shot and I really like that feeling that the image gave me, so I would like to share it here. I have cropped it to make the composition more tasty. No additional editing was done and I just left it that way, untouched but cropped. Besides the gondolas which offers various tours, there are also ferries which are “water buses” that ferries passengers across the waters. I have tried to navigate around the buildings trying to get across to another just by foot but in vain. I would recommend tourists like myself who is not familiar with Venezia to take the water buses around which proved to be much more easier with a one-day ticket that you can purchase at the counter. The one-day ticket we bought entitled us to full day unlimited usage of buses that ferries us from our hotel in Mestre to Venezia station and also unlimited rides on the water buses. All we have to do is to have a Venezia map with us and look for the number of the water buses that would stop at various stops that you wish to visit. With a backpack, it is not at all possible to carry your backpack on your back but to hold it in your hands in front of you during the rides in the water buses, if you do that, the water bus crew would ask you to leave your backpack down. From the image, you can see the authentic gondolas and the water bus on the water with the background of the buildings in Venezia which are under restoration works or maintenance. This can shows that Venezia has a very long history and needs constant maintenance to keep the beautiful state of the architectures. Continuing my journey next to Venezia from Firenze. I have heard and seen so much about beautiful Venezia that might not be in existence anymore in another few hundred years’ time. 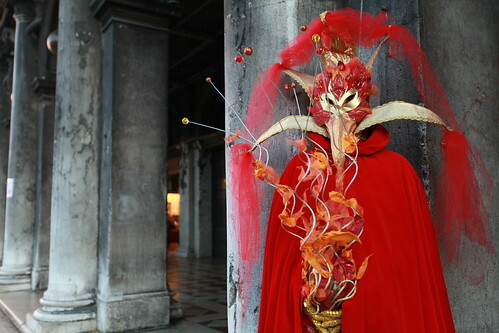 For this trip there, I arranged it in a date that I will be in Venezia for its Carnival 2012 when participants will don themselves up with decorative masks and costumes. I guess it is kind of cosplay? When I was there, it was so lively and crowded that I have had so much opportunities for photography on those interesting costumes. Not only the locals took part in the Carnival but I have seen many tourists taking part in this Carnival with their costumes. 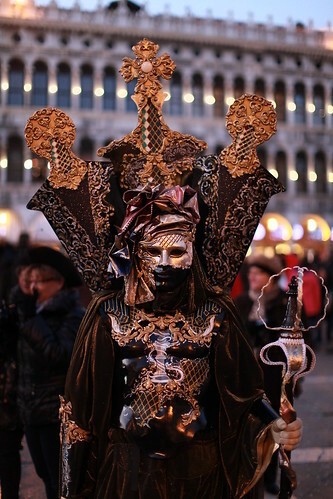 Piazza San Marco is the square where all the crowds were to proudly showcase their gorgeous masks and costumes. It was rather difficult to capture shots of the people in nice masks and beautiful outfits as crowds will circle around them taking photos as well. Fortunately, using my 50mm f1.2 L on my 5D II, I have captured really nice close up shots. I would like to first share some of the shots that I have done with my 50mm f1.2 L that really helped when it turned dark in the evening. 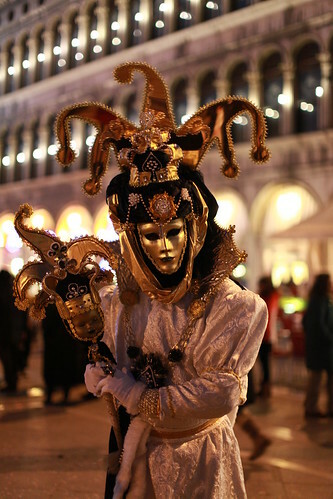 I hang around San Marco Square till late to enjoy the fun of the Carnival that happens once every year. I did not edit any of my shots but only cropping was done on few. 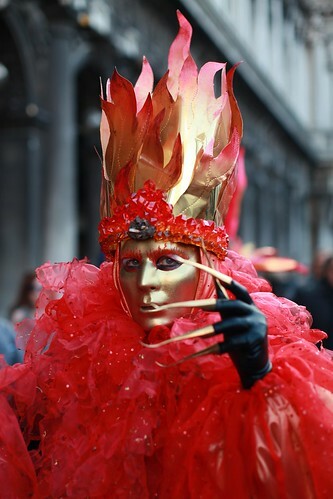 There are so many various kinds of masks that I have seen in the Carnival and most of the people in the photos I have shown were wearing Volto or Larva which forms the shape of a human face. There is another kind of masks that I have seen but not really fascinated about it as much as the Volto. Anyhow, these venetian masks were really interesting and they are not as much available other than Carnival. 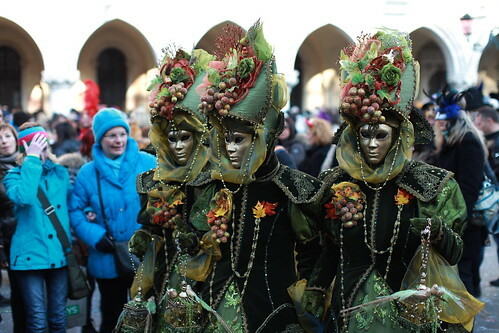 If you are planning to visit Venezia during its Carnival, be prepared to face really huge crowds there as the whole Venezia islands will be very crowded especially over the weekends as tons of tourists would visit Venezia for the same cause. I have chosen a very relaxed way on my first day there, sitting down near a cafe in San Marco Square and have a latte while indulging myself in both my drink and the Carnival happening. The drinks are not cheap there, so do not be surprised as Venezia is a very commercial place. 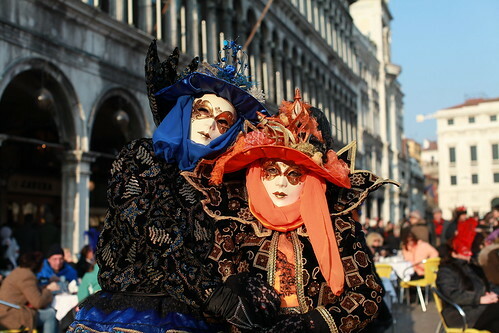 Besides individuals who dressed up in their Venetian costumes and masks, you also can see many groups of people who wear almost or identical costumes. That is really interesting! But the most common ones are the couple who preferred to wear Victorian costumes which are so elegant and graceful. I will never forget my stay there for its fun I have had there. The next few photos were taken with 16-35mm f2.8 L on 5D II to capture groups and couple shots. 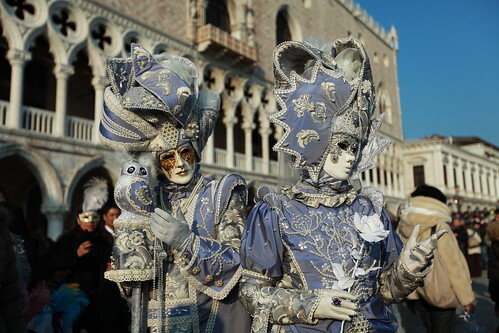 I can tell they could have spent a bomb on their costumes, everything did not come cheap in Venezia. For the shot below, the sun was setting and had a heavy cast on this couple here that gave nice contrast on them. This is one of the shot that I like for it color and design. As you can see from my images, those people are not camera shy and I was there just clicking my shutter away, also trying to squeeze into any crowds that were also taking pictures. This experience is definitely one of its kind. 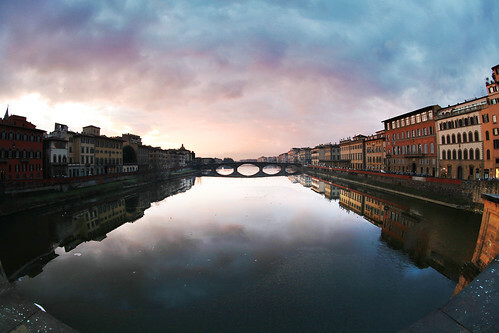 What more can we ask for when we have a gorgeous sunset in Firenze just when we were starting to explore Ponte Vecchio. Perfect timing when we ere there and I just loved my luck! While the sun was setting, wild birds were flying around making the place so lively. 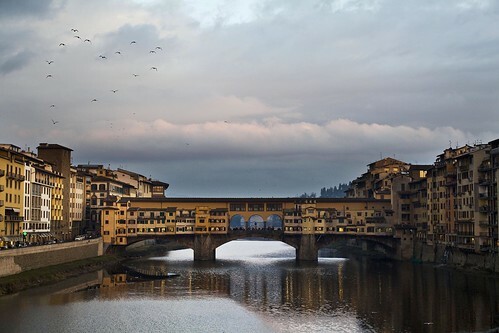 This bridge which spans over the narrowest part of the Amo river is one of the attractions that we wish to visit during our stay in Firenze, Italy. This bridge was believed to be first built in Roman times and has a lot of history behind it. I was cherishing my time around the bridge to take in the magnificent view that the sunset has offered, slowly grabbing my shots as well. With my 50 f1.2 L lens on my 5D II, I framed my shot on this well known bridge and start clicking away at f4 and 1/320s shutter. The reason why I was so satisfied with this shot is that during my framing of this bridge, I was ready to wait for flocks of birds to fly past to create beautiful scenery to take in with my camera. To my delights, those lovely birds indeed made a very nice shot of mine with a very coincidentally heart shape! I also increased the contrast by a bit and balanced the exposure of the water with the sky. 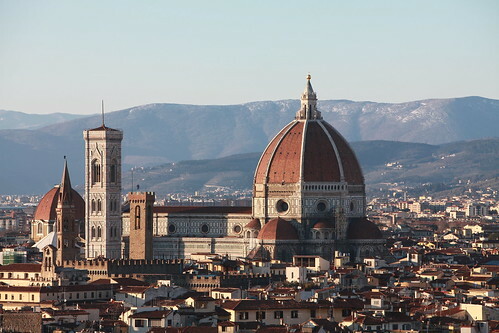 With the perfect weather, we strolled around Firenze on our second day stay in Italy. In comparison of Firenze and Roma at that point of time, Firenze seemed to have better weather than Roma where it was really cold and freezing. As the sky turned darker when the sun set, the clouds above made beautiful overcasts. I was lucky to be near the river while the sun started to set. Using my fish eye 8-15mm f4 L on my 5D II, I walked to the middle of a bridge while I framed my shot. The photo below shown was taken hand held. Seeing the opportunity to enhance the photo, I edited the shot using photoshop to balance the exposure of my foreground and the sky. I managed to expose the water correctly so that I can see the reflection of the sky. Taken with F8 and 1/40s shutter ensures the detailed shot for editing to be done easily. I also increased the contrast of the sky to give more dramatic feel to the clouds. I can say I pretty much like the sunset color cast on the sky. 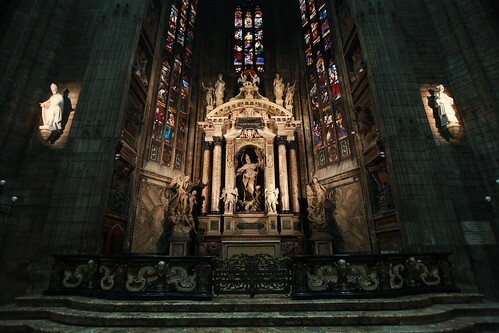 Once inside St Peter’s Basilica, I knew I have to start using my EF 16-35mm f2.8 L for its low light ability. The place is simply gorgeous and I was clicking away so happily. We explored around quite a bit and I really like few pictures that I have done there which I would also want to share here. My choice of U.W.A. lens 16-35mm f2.8 L kept my perspectives in place while getting shots of the beautiful architectures. 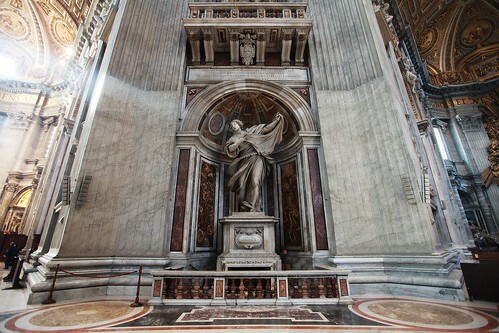 The first image that I want to share is a statue of Saint Veronica offered Jesus her veil to wipe his forehead. The image of Jesus’s face miraculously appeared on the veil after using it and giving it back to Saint Veronica. That is why she is holding a veil in her hands. I did some changes on this picture to increase its contrast and sharpness. EF 16-35mm f2.8 L on full frame camera indeed allowed me to frame this shot while I stood fairly near to it so that I can exclude all other visitors walking in the foreground. And of course, I have to also frame my shot in such a way that everything is balanced and straight. It took me quite a while though. And moving on, Saint Peter’s Basilica has such huge interior that you can easily use up half a day to visit this wonderful place. Everything in there is just so fascinating. 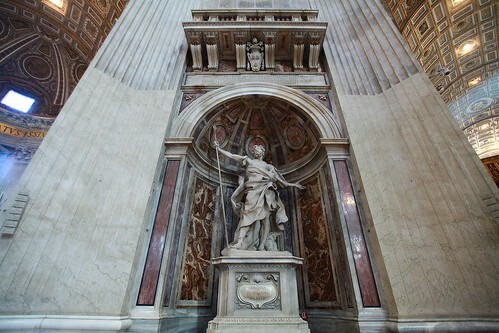 This statue in the image shown next is Longinus with a spear which pierced Jesus. I am truly fascinated by these shots. This image was also edited to increase the contrast and sharpness. As we reached there very early in the morning, there are not too many visitors at that time yet, so that is why I took my time to frame my shot without anyone walking past or standing around.